Max elevation: 1,488 ft.– total elevation gain approximately 1,737 ft. The Fishkill Ridge Conservation Area, owned by Scenic Hudson Land Trust, Inc., is located in the northeast section of Hudson Highlands State Park Preserve, and is managed as an extension of the park. Scenic Hudson has protected more than 1,300 acres along Fishkill Ridge, facilitating creation of 11.5 miles of challenging wilderness trails that allow visitors to walk beside a stream to a waterfall, scramble up rocks and step onto outcroppings affording some of the most breathtaking long-range vistas in the Hudson Highlands. Lambs Hill is in the center of the Fishkill Ridge Conservation Area. It is situated between Mount Beacon and Bald Hill and can be directly accessed via 3 different routes. There are connections to additional trails in Scenic Hudson’s Mount Beacon Park and Hudson Highlands State Park. At an elevation of 1490 feet, it offers some of the most scenic, long-range vistas in the Lower Hudson River Valley. The rugged, hilly-to-mountainous terrain includes steep climbs and some scrambling over bare rock. While the views itself are reason enough to undertake the strenuous nature of this hike, the solitude is the real payoff. The crowds that flock to North and South Beacon Mountains rarely make their way to the northeast section of the ridge. Overlook Trail: From the parking area, this trail climbs the ridge via switchbacks and long traverses, with overlooks offering sweeping Hudson River views. It crosses Clove Creek, shaded by towering hemlocks, sugar maples and oaks. On the ridge top, dwarf pitch pines, scrub oaks and mountain laurel predominate. The trail traverses bare rock, affording an unobstructed view to the northeast. After approximately 1.75 miles, the Overlook Trail ends at a junction with the white-blazed Fishkill Ridge Trail. 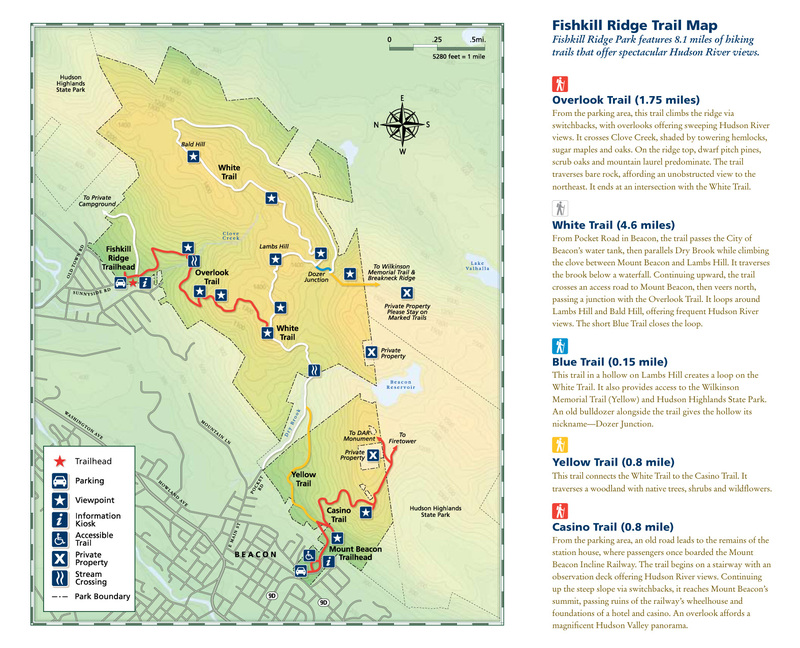 Fishkill Ridge Trail: Passing the junction with the Overlook Trail, it heads east, up to the summit of Lambs Hill, offering broad views of the Hudson River and beyond. From this point, one can choose to continue on the white-blazed Fishkill Ridge Trail and explore more of the East Hudson Highlands. The Fishkill Ridge Trail continues northeast to Bald Hill and loops back around. Along the way, the yellow-blazed Wilkinson Memorial Trail, the Blue Connector Trail and numerous unmarked footpaths and woods roads make any number of loop hikes possible. It was in the low 30’s on a Sunday morning so we got a late start, waiting for the temperature to rise a few degrees. There was only one car in the sizable parking lot when we arrived shortly before 10:00 am. The trailhead is at the rear of the parking lot on Sunnyside Road. An information kiosk and three red markers on a tree, designate the start of the Overlook Trail. The trail climbs gradually at first, crosses a small wooden footbridge and passes some large boulders. In about 260 yards, the Overlook Trail reaches a junction with a white-blazed trail, which starts on the left. There is a sign posted high on a tree with an arrow to Malouf’s Mountain Camping, where the white-blazed trail diverts from the main path. The campground, which is hike-in/hike-out, offers both platform and primitive sites. The trail descends a little, curves and then cuts into the shoulder of the hill, continuing on a narrow footpath. The Overlook Trail then descends to Clove Creek and crosses it on rocks. The trail then begins its steep ascent of Lambs Hill on switchbacks. Around this point, there are faded orange or yellow markers that overlap the red blazes. I found this confusing and thought that we had missed a turn somewhere. As it turns out, this is the red-blazed Overlook Trail and we continued ahead. The trail continues to zigzag steeply up the ridge, along craggy ledges and rock. At times, the use of hands as well as feet is necessary. After about 1.1 miles from the start, and a brief rock scramble, the Overlook Trail comes to an open rock ledge with views to the northwest. The City of Beacon can be seen directly below, with the Hudson River Valley beyond. The Mid-Hudson Bridge, Walkway Over The Hudson and the Catskills, are visible in the distance. The trail continues to ascend steeply offering more viewpoints, with the Newburgh-Beacon Bridge and Hudson River visible below. After climbing some more, the trail levels off somewhat at 1.4 miles and passes along old stone walls through abandoned orchards. After about 1.75 miles and 1,000 feet of elevation gain, the trail comes to an expansive view from an open rock ledge, right near its terminus. A short distance later, the Overlook Trail ends at a T-intersection with the white-blazed Fishkill Ridge Trail. We turned left and began following the white blazes. The Fishkill Ridge Trail heads east along the ridge towards Lambs Hill. The trail is relatively level at first, then dips down and parallels a stone wall. The Fishkill Ridge Trail turns left, crosses over the stone wall and continues to parallel it until it reaches a large rock formation. The trail turns left, climbs alongside the rock formation, then turns right and continues atop the same rock formation. A slight scramble leads onto open rock near the summit. Just before the summit of Lambs Hill, there is a flat area with great views of the Hudson River Valley. A small rock scramble Leads to the summit of Lambs Hill with a nice flat area for taking a break high up above the Hudson Valley. The true summit doesn’t have a good view, but we stopped to rest for a few minutes. We walked back down to the flat area just below the summit of Lambs Hill, and enjoyed the sweeping views. Just to the south, from left to right is, South Beacon Mountain, with its fire tower at the summit, the Beacon Reservoir in the center, and North Beacon Mountain, marked by the radio towers at its summit. The Mount Beacon Fire Tower at the 1,610-foot southern summit. The highest point in the Hudson Highlands. Looking northwest over the City of Beacon and the Hudson Valley. The Hudson River, The Gunks and the Catskills. Skytop Tower and the Shawangunk Ridge can be seen to the northwest, with the Catskill Mountains just beyond. Raptors can be seen hovering high above. It was windy up on Lambs Hill and the combination of sweat, near freezing temperature and cold river breeze, brought a chill to my bones. We decided to retrace our steps back the way we came, rather than continue on to Bald Hill, which was our lofty aspiration. When we reached the junction with the red-blazed Overlook Trail, we turned right and began the steep descent that awaited us. We stopped at all the overlooks on the way back down to take in the views once more. Below is the Fishkill Correctional Facility, with Dutchess Stadium on the far left. The trail was filled with leaves, which made the trek downhill a little more treacherous. At times the leaves were so deep that we had to be careful not to step on the side of a hidden rock and twist an ankle or worse. Other times the leaves and the ground or rocks underneath were wet and/or frozen. I must have slipped a dozen times, but somehow didn’t fall. The overlooks along the way gave us an excuse to take a breather. On the way down, we passed quite a few afternoon hikers going in the opposite direction. I was surprised, on my previous visit, I didn’t see a soul. At the base of the steep descent, the trail turns left and crosses Clove Creek. When we reached the junction with the White Trail, we turned right. Continuing on the red-blazed Overlook Trail is shorter and a more direct route back to the parking area. We followed the white blazes for about 275 yards until we came to a woods road. Turning left on the woods road, leads back down the hill towards the parking area. We decided to turn right and follow the eroded road steeply uphill to search for something. It was getting late in the day and we were exhausted by this time, so we only followed the eroded woods road for about 400 yards. That ended up tacking on another 260 feet of elevation gain to our hike. We walked downhill on the woods road until it connects with the Overlook Trail and followed the red blazes back to the parking area, where the hike began. This hike was a real workout and I was worn out at the end, but felt a sense of accomplishment. There are no easy trails here, but the views and lack of crowds make this a worthwhile hike. I look forward to hiking this area again soon. Pros: Lesser traveled area, sweeping Hudson River Valley views, rugged terrain. Cons: Overlook Trail a bit confusing with two different color blazes. The leaves are a beautiful colour…despite being a bit of a pain to hike over 😀. Sounds like an enjoyable hike & nice to find an area that doesnt have too many people around.